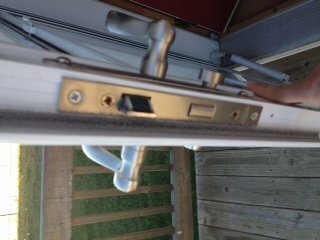 I have a Larson storm door that will not latch unless you turn the handle manually to latch it. 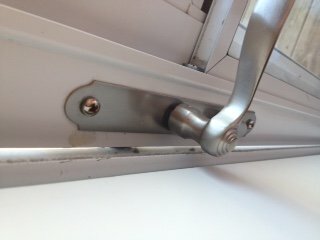 When the door shuts on its own it just bounces off of the frame and stays open, getting caught in the wind until you go over and turn the handle to latch it. The latch moves freely when you push it in without sticking. Even if you pull of push the door to try and latch it, it will not latch until you turn the handle. Hopefully the pictures attached can help show better than I can describe it. Any help would be greatly appreciated. Since the holes for the latch were punched into the Z Bar at the factory there should not be anything wrong with that. I'm assuming the door worked fine when it was originally installed. In the last picture where the latch was photographed from the inside the door seems to stick out more at the top than at the bottom. It could be that the frame of the house has settled and thrown the door frame and the storm door out of alignment. If thats the case you may need to put shims behind the vertical Z-Bars of the storm door so that it is perfectly plumb and in alignment. Sometimes I completely remove the storm door and reinstall it because of settling problems. Maybe you can get away with just shimming the latch side. Another thing to try is remove the screws that hold the latch side Z Bar on one at a time. Start from the top down on your door. See if the Z bar needs to be screwed in so it sticks out a little further. As you take each screw out, check to see if the door closes properly. Sometimes the Z bar will spring into the right position and make it obvious where it needs to be shimmed. If you have to make the Z bar stick out more at the top, you will probably have to put shims behind the top rail to make it match the new Z bar position. Not all door frames are perfectly straight or plumb. 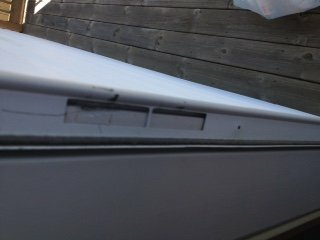 Sometimes when you install the storm door there will be gaps because the door frame is leaning in or leaning out by a degree or two. To fix that installers use aluminum back up rails to cover the gaps, or use a matching color of caulk to fill in the voids. 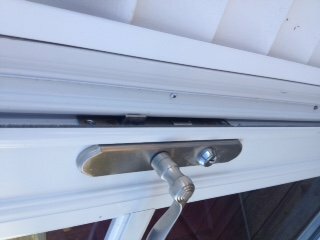 Comments for #Larson #storm door will not latch shut! Same problem here. Looks like the same exact door I have. Mine is about 4-5 years old, though. Worked fine until recently. Though, the positive pressure mentioned by someone has always been an issue. But now it's as if the latch is protruding out just a little too far. Even with the curvature of the latch, it hits the vertical frame piece and stops (unless very hard slam). If I depress the latch with my finger from the outside just a tad, it slips right in and the door will close and latch just fine. Is there a way to adjust how much the latch sticks out? Everything looks plumb and true, screws are all tight. We have a similar problem, Larson security door closes but won't latch unless yo lift up on the handle. The latch spring has become weak as if I take the handles off it works fine. Currently waiting on Larsons response but feel sure at a couple years old it will be my problem. Any suggestions are greatly appreciated. My Larson door was recently installed and it will not latch without manually pushing it shut. I called Larson and was I was told that unless I leave the window open on the door I would have to close the door manually. Do other companies sell doors that actually close themselves? Wow, we have the exact same door with the exact same problem! Gets a little worse every year. Used to be a problem one season and not the next. But now it's always doing it. Now we know what to try to fix it, thanks! I have delt with the same problem with more than one Storm door. The problem is only when leaving the house. When entering there is no positive pressure or, the screen is open, the door slams shut. When you leave the house and the interior door is closed, that’s when the problem occurs. The Storm door slams almost all the way, but won’t latch because there’s no where for the trapped air between the doors to go which causes the storm door to not latch. I am not exactl sure how to fix this problem as you want both doors to have a good seal. As I see it there should be a one way vent to allow air to escape, but then close immediately. I have a few things that might work. I will post back and let you know how they work. I have the same problem. I think the handles are too heavy and compress the latch spring way to much. There is not enough purchase on the mortise to stay closed. I’m going to try adding a heavier spring .